As you begin maneuvering for the planned approach, the controller states that, due to a marine layer that has moved into the area, visibility has gone from the forecast 2 mi. to less than a quarter of a mile. You’ve come prepared. Thanks to the special onboard systems, this approach is authorized down to zero/zero conditions. It is flown completely by the autopilot. On final, the aircraft stabilizes, and with the autothrottles making minute adjustments, the approach continues. You hear, “Two hundred” as that radar altitude slips by. You know that this is the point where you would normally have had to see the approach lights, but you don’t. You continue. “One hundred.” Still there is nothing in view out the window. “Fifty” . . . nothing. “Forty” . . . nothing. “Thirty” . . . nothing. The autothrottles bring the engines to idle and you note the nose of the airplane rising as the autopilot commands a flare. The main gear kisses the concrete and as the nose lowers to the runway, you are just able to see the first couple of runway lights ahead of the airplane. Safely and right on time, you’ve arrived. Welcome to 1972. The approach just described was “shootable” way back then in airplanes equipped with Category IIIC landing systems. Remember that CAT IIIA requires 700 RVR and CAT IIIB requires 150 RVR, but CAT IIIC has no visibility requirement. If the technology existed more than 40 years ago, why aren’t all airplanes flying today able to make zero/zero approaches? As is almost always the case, money was the problem. The systems of the early 1970s comprised mostly analog computers requiring continuing bench checks to ensure accuracies. Even when automatic flight systems switched to digital and the requirement for checks could be handled by electronic self-checks, there was a lot of money required to be able to shoot CAT III approaches. The approaches had to be kept clear of obstacles. The difficulty ensuring this was demonstrated when a Learjet flew through trees on a simple GPS RNAV approach to a small rural airport. Turns out those trees had grown up into the approach path since the approach had been certified. Fortunately, the crew and the aircraft survived the encounter. This is a synthetic vision picture of an approach that is less than 100 ft. from touchdown in zero-zero conditions. Think you could land out of this? The need for ensuring clear CAT III approach paths to major airports was obvious, and costly. Systems and pilots had to be kept current through practice approaches. Those approaches could only be done in good weather and were usually nullified due to other equipment, in the ILS critical area, disturbing the signal. Airplanes had to be sequenced onto final by a controller, rather than onboard systems. The required ILS transmitters for the approach had to transmit signals so strong and clear that only the most expensive equipment could be counted on to provide them regularly. A zero/zero approach also required that you be able to see well enough to taxi after landing. I think, if we’re smart, we are finally approaching an era of routine, cost-effective zero/zero approaches for all. There are two reasons, both technological. One is the potential accuracy of GPS-fed ground-based augmentation systems (GBAS). The second is the ability to translate, through synthetic vision, the accuracy of the GBAS into a VFR picture of the runway upon which the landing is to be completed. Previously I’ve written of my dislike of the head-up guidance systems that we currently use for the lowest of visibility approaches. But for now, let’s assume that you can transfer a perfectly usable “head down” synthetic picture of the runway environment to your head-up guidance system. That allows this presentation to continue with each camp happy that it is being considered. In the mid-1990s, we started seeing GPS approaches come into use. These were a wonderful way of overlaying an already existing VOR or ADF approach and smoothing the step-down fixes into a stable and steady let down from the point of descent to the MAP. Nevertheless, the accuracy of the system only allowed descent to MDA-type minimums. 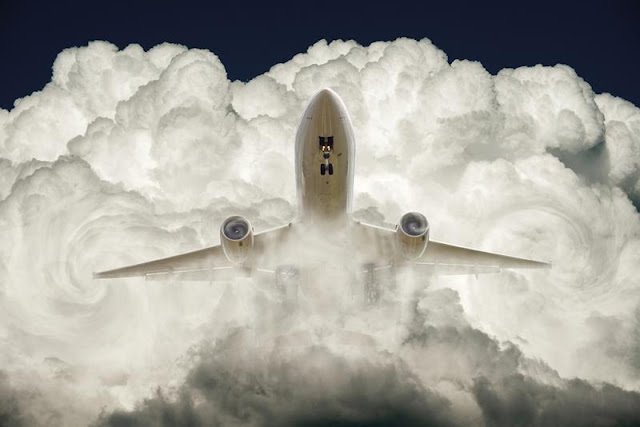 It wasn’t long until the RNAV approaches became LNAV/VNAV with the increased accuracy provided by more sophisticated FMS systems that could generate, then follow, a virtual glidepath connecting the altitudes of the approach from the stored database. Then came the wide area augmentation systems (WAAS), which involve multiple, precisely surveyed ground reference stations across the U.S. These stations monitor GPS satellite data, which can be skewed by orbit and clock drift and by the atmosphere and ionosphere. A pair of master stations, located on the Atlantic and Pacific coasts, collect data from the reference stations and create a GPS correction message. The corrected differential message is then broadcast through one of two geostationary satellites to WAAS-capable receivers, which can provide better than 3-meter position accuracy 95% of the time. The more precise positioning information allowed for descents to LPV (localizer performance with vertical guidance) and LP minimums. These approaches, using WAAS, have been designed to provide accuracy similar to a Category I ILS. Also similar to ILS, in an LPV approach position sensitivity increases as the aircraft nears the runway. Vertical guidance with WAAS is also more sensitive approaching the end of the runway. This sensitivity, combined with WAAS horizontal and vertical accuracy, results in lower descent altitudes. By contrast, LNAV approaches maintain a 0.3-mi., from center to full deflection, tolerance from 2 mi. prior to the FAF all the way to the approach end of the runway. And as with its horizontal guidance, non-WAAS approach vertical guidance is also linear. For that reason, it’s important to remember that “just a dot low” on an LNAV/VNAV approach can land one well short of the approach lights. GBAS (ground-based augmentation system) is basically a WAAS shrunk for an individual approach area or airport. In fact, this type of system was originally designated as a local area augmentation system (LAAS). Just as WAAS relies on precisely located ground stations throughout the country, GBAS, such as the stations installed at Newark-Liberty International Airport (EWR) in New Jersey and at George Bush Intercontinental Airport (IAH) in Houston, is keyed to three or four such stations around a specific terminal area. Similar to WAAS, the GBAS stations use a VHF radio link to provide aircraft with GPS corrections, integrity and approach path information. The result is much tighter position data. 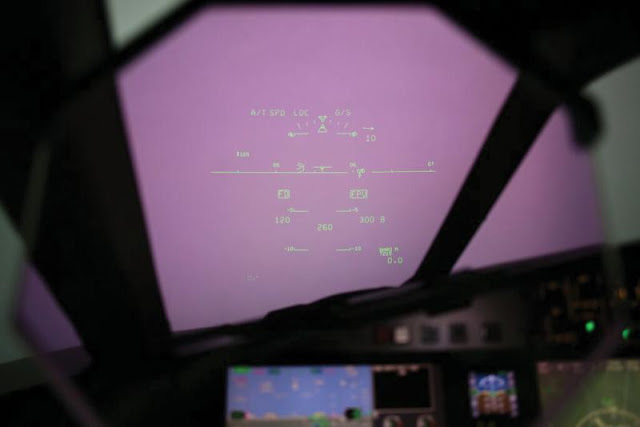 This is a picture of a head-up display showing the airplane in the same position as the SVS picture on the opening. Currently, GBAS standards are only able to support minimums of Category 1-type approaches. CAT I GBAS is referred to internationally as GBAS Approach Service Type-C (GAST-C) (CAT I minima). The FAA is now focused on validating standards for a GBAS Approach Service Type-D (GAST-D) (CAT III minima) service with an accuracy of less than 1-meter divergence in both lateral and vertical guidance. That’s a pretty tight approach. The agency’s schedule calls for GAST-D GBAS availability in 2018. These GBASes are designed for a limited radius of approximately 23 mi. from the subject airport. One set of corrected position transmissions can serve a number of different runways in the same area. In a two-year-old Notice of Proposed Rulemaking (NPRM), the FAA has delineated many developmental problems with low minima GPS-based approaches. Other commenters have put forward other concerns. Still-unanswered questions include how many instrument approach procedure plates will be required? Should the plate include minima or should those be determined by the pilot? Do you replace ILS systems with GBAS? What type of minima do you give various capabilities, including LNAV, LNAV/VNAV, LPV and GBAS? What would be the economic impact of these decisions? Couple these concerns with those of avionics manufacturers awaiting economic incentives to fully exploit synthetic vision, and I worry that this breakthrough technology could be stalled indefinitely. And yet, synthetic vision, heads up or heads down, is the key to zero visibility landings. 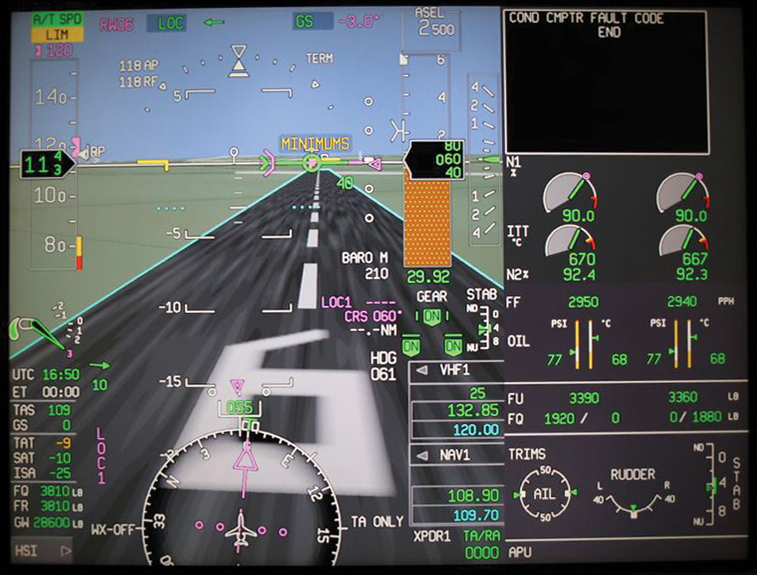 Picture of a head-up display showing the airplane approximately 100 ft. above minimums. Sometimes you will pick up runway lights at this point and lose sight of them as you continue. We should move toward no weather minimums for synthetic vision aircraft, with GBAS equipment, at GBAS airports. Since the vertical guidance for these approaches comes from the satellites and not from a ground-based glideslope, virtually every runway can have ILS precision. To my thinking they all would use the same basic type approach plate with the final approach course and feeder fixes depicted geographically. The minima would be determined only by the capability of the GPS system on board the airplane. Everyone would have to have a GPS receiver to do “precision” approaches. As I’m finding out with my Baron, the cost of these systems is remarkably low due to advances being made in technology. We shot some approaches in a Falcon 2000EX EASy simulator at FlightSafety International’s Teterboro Learning Center to test my theory and get some photos. Being there again brought some memories out of the old database. I first attended a Falcon 10 initial at FlightSafety’s LaGuardia Center in December 1974, right after being hired by the American Can Co. At that time, all the simulators were giant metal boxes with a cockpit inside. While some of these boxes had motion bases, none had visual systems. Rather, the windscreens were painted gray. When FlightSafety developed its first visual simulator, it was installed at its then-new facility at 90 Moonachie Avenue, hard by Teterboro Airport (TEB). I trained on it. Later, the company moved to a larger facility across the street, and I continued training at that location with Falcon 50, 2000 and 900EX courses over the years. Since then, the company has completed a spectacular rebuild and expansion of that complex. It is state-of-the-art and a beautiful showplace and much to the benefit of FlightSafety’s customers. I had two of FlightSafety’s best instructors, Eric Santos and Brian Walk, in the 2000EX sim to help me set up the HUD and SVS photos seen here. The idea of the pictures is to assist readers in visualizing the “view through a HUD” without synthetic vision. This is the view from which critical low-altitude decisions must be made. Using the infrared enhanced visual system (EVS) on a Falcon 7X, I actually landed at New York’s Westchester County Airport (HPN) out of two approaches during which visibility was below 200 and a half. We did this by activating the EVS on the HUD and flying the approach to minimums. During the approaches, both in dense fog as only HPN-type airports can generate, we picked up some approach lights at about 210 ft. The first sighting, just above minimums, was caught by the copilot on the MFD and not through the HUD. As those light sources came into the HUD, we proceeded to 100 ft., where we barely picked up the actual runway and landed. Those few seconds between about 50 ft. above minimums and then down to 100 ft. were the most intense, non-combat, moments in my 50 years of flying jet airplanes. The heat sources were just visible at 200 ft. My neck was strained to an elongated position to see the display and I had to rely completely on the other pilot for all in-cockpit requirements. There was no time in those last several hundred feet to do anything but stay welded in that position, pick up the “real” lights before 100 ft., continue to the ground and “thump” the airplane on due to the context shift, as I went from the HUD to real world. In my “future” SVS I would have a flare cue as used in the earlier Rockwell CAT IIIA HUD fitted on the Falcon 2000. This was in the form of a sort of reverse glideslope, working off the radar altimeter. When the flight director received those flare signals, it commanded nose up for touchdown. Simultaneously the words “idle” appeared in the display. Every landing I ever made with this system was smooth. The most accurate landing I ever made was when Rockwell, through FlightSafety at TEB, had a bunch of pilots each fly some 20 to 30 approaches with the HUD and flare cue. On one of the approaches the instructor started to change the weather. In so doing, the view out the simulator window went to zero/zero and remained there because the instructor forgot to input the new weather. I had been told to land out of every approach and that the distance from the desired touchdown spot would be noted. On the approach in which I could see nothing but the HUD with a flare cue, there was no distance between my touchdown and the desired point. 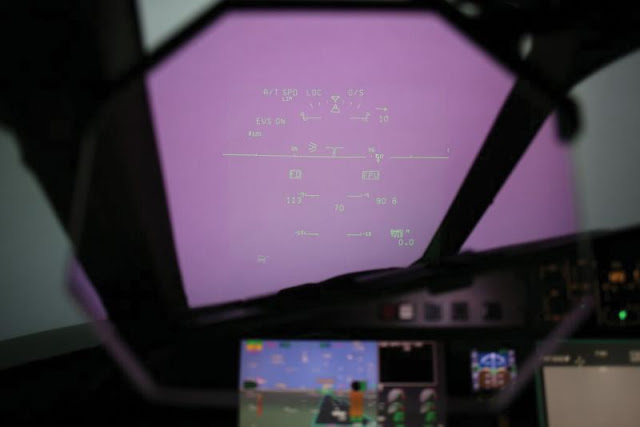 The photos used here show both the HUD with EVS and the SVS displays of the runway at 100 ft. above minimums and at roughly 100 ft. above the ground. The latter depiction even with the SVS on, could actually occur if you happened to pick up the heat signatures of the landing lights while at 200 ft. but lost them in more dense fog. So, at 100 ft. you would have to initiate a go-around. I know how tense flying near that altitude can be, with a blank view through the HUD. However, that intensity eases substantially when you can “see” the runway in an SVS display and then proceed calmly to the runway and a “visual” touchdown landing through use of a flare cue. (“Nice touchdown, captain.”) Remember, that runway’s actual centerline is within 36 in. of the image depicted on the SVS display. And once on the ground, taxiing in zero/zero conditions could proceed at least until well clear of the runway and where you await a “Follow me” vehicle. CAT III approaches were safe in 1972. They can be that and more with SVS. Going forward, synthetic vision is the key to landing in all weather conditions.